In 1994, we left New Hampshire for warmer clime. Gene had a job offer in Ardmore, Oklahoma, and we were thinking it over in February, when the morning temperatures were in the -30 (Farenheit) range. It wasn't a diffucult decision. We moved there to be in a small city, thinking it would be a gradual transition from our rural life. We loved the people there and loved the weather, except for the tornados. But we soon realized we needed a larger city and in 1999 moved to Petersburg, Virginia, to be near Richmond, a larger city. But our time in Ardmore introduced us to the people of Oklahoma, and that is what drew us back to this part of the country. Oklahoma, like Arkansas, is a great, undiscovered treasure. The land is beautiful, but it is the people that are the best thing about it. While we were there, we visited New Orleans often, and spent some time with John Mooney, the world's greatest slide guitar player. 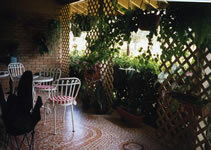 The front porch of our rent house in Ardmore. It was a lovely house, on a former small cattle ranch, with an oil well in the front yard. This is Bo. 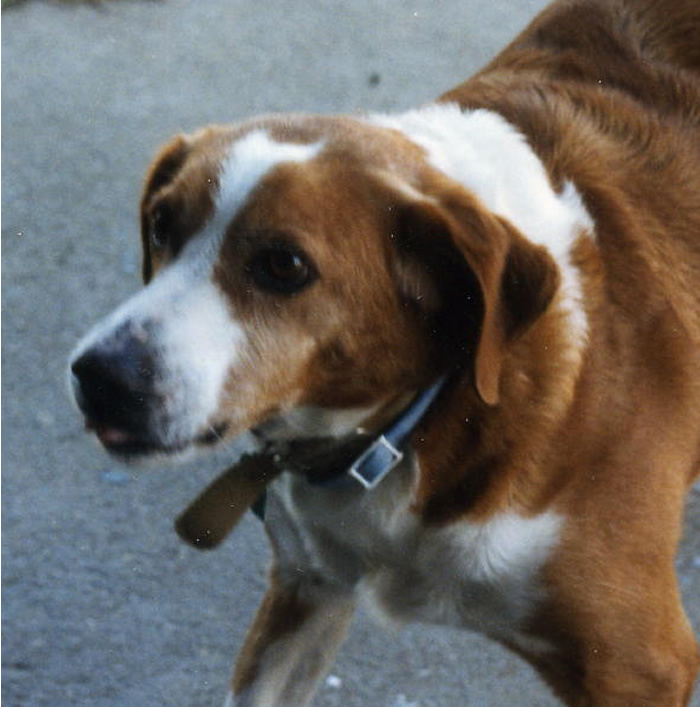 She was the best dog in the world, ever. Bo had lived at the house before us and could not adjust to city live when Marnelle moved to town and sold the house. So Marnelle asked us to take Bo, and we did. There was never a dog like Bo, and we miss her terribly. Three lovely ladies: Tina Fore, Ellen Andes, and Mollyann Cypert. 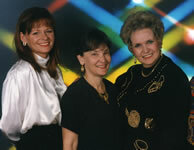 Photo taken at a hospital sponsored dinner-dance in 1995.